Sean was commissioned by JPMorgan Chase to build a LEGO model as an attraction for home builders at a builder conference in February 2007. 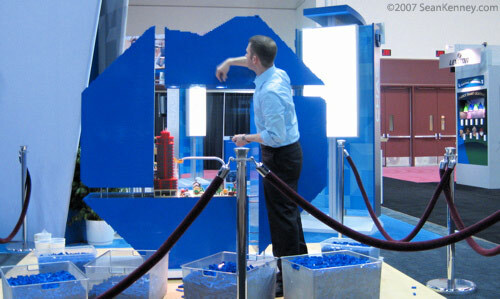 After 57,000 LEGO bricks and 310 hours of building, Sean completed the logo at the 2007 International Builders Show (IBS) in Orlando, Florida. The Chase logo proved an interesting shape to build as a freestanding LEGO sculpture. Since the logo is comprised of four disconnected "wedges", Sean had to devise a way to make them seemingly float in space, while still remaning sturdily attached and safe. The show attracted over 120,000 people and Sean's LEGO sculpture created "a ton of great buzz" for the Chase booth. The completed logo will tour the country and appear at several other conventions during 2007. Since the giant LEGO model was used to illustrate Chase's mortgage and builder development offerings, a LEGO city was built inside the center of the Chase logo, depicting suburban and urban home and condo development. See 15 more pictures of the suburban LEGO town. Most people don't realize how much engineering a LEGO sculpture of this size requires!